I was chatting with a friend today about how I'm considering investing in REITs, and he reminded me about how the rising interest rates environment are going to impact REITs negatively, since they mostly have high gearing on their properties. Then I realized, oh dear! REITs won't be the only ones affected when the Fed raises interest rates, because that affects our home loans too! Most home loans are pegged to the Singapore Interbank Offered Rate (SIBOR), which is the rate by which our banks lend to each other. The 3-month SIBOR rate is the most often used standard in such floating rate packages, which means the interest rate you pay on your home loan will be revised every 3 months together with the add-on percentage until the next rate review date. The SIBOR is tied closely to Fed interest rates. The 3-month SIBOR rose to 1.13375%, almost 3 times the 0.44437% level seen just a year ago! This was in December, in the wake of the Fed raising interest rates for the first time since 2006. More Fed rate hikes are expected. The higher the rates, the more we consumers will end up having to pay on our home loans. 3M SIBOR + 0.8% (assuming reduced fees as a sign-up promo). 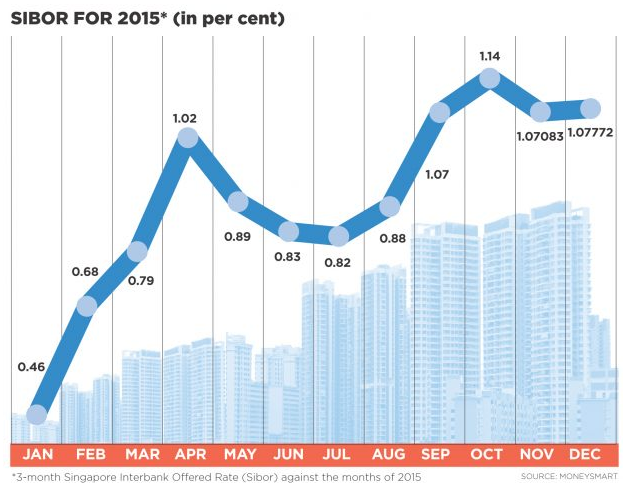 If the prevailing 3-month SIBOR is 1.1%, then the total interest rate due on your loan for that quarter would be 1.9%. Are there alternative home loan packages? On top of SIBOR, you will also encounter SOR (Swap Offer Rate), which tends to be more volatile. The SIBOR is generally determined by the demand and supply of funds in Singapore between the banks, whereas the SOR is influenced more by external factors such as USD interest and exchange rates. As such, it is also subject to greater fluctuations due to forex movements. Other than SIBOR and SOR-pegged loans, banks also offer fixed rate packages. DBS also recently became the first bank to introduce home loan rates pegged to fixed deposit rates as another new option. OCBC and UOB has thus followed suit. As a general rule, floating rate packages are typically lower than fixed rate packages. If you're keen to understand more about home loans in Singapore, I recommend that you refer to this government resource by MoneySENSE here for objective reading. What should I look out for when choosing a home loan package? - Effective interest rates (calculate rates for preceding years; I recommend using 3 to 5 years as a gauge). - Lock-in period. Most banks vary between 2 to 3 years as a minimum commitment, after which you are free to switch to a more competitive offer. - Bank subsidies for miscellaneous fees like valuation, legal and conveyancing services, fire insurance, etc. Check out more questions you should consider in this other online guide here. Ultimately, the most important question you should ask yourself when choosing a home loan package is: Can I afford the loan instalments? Should I refinance my home loan? Yes, definitely! If you're willing to do a little bit of homework and comparison, switching your home loans can give you quite a bit of savings as the banks compete to win over customers from each other. Just remember to consider switching costs, like legal and cancellation fees. I wouldn't recommend refinancing before your minimum commitment term on your existing home loan package is up because these fees can add up to more than the savings you stand to enjoy by switching. Now that I'm due for signing on a home loan anytime (once we find a suitable house, that is), I really hope the interest rates won't be too high when we're ready. Let's hope the interest rates won't rise by TOO much. I'll continue to monitor the situation. Thanks for sharing such informative blog on Home Loan Interest Rates. IF interested Fill immediately and return. you looking for a mortgage? Looking for a quick loan or a funding firm for a business deal, contact us today at Atlas-loan company for a loan or investment funding from $5,000.00 to $100,000,000.00. Great blog..... very informative, it'll help lot of people. I suggest Mortgage Providers for better solution. Hello Every One, I am Mrs Betty Magel From USA, I quickly want to use this medium to shear a testimony on how God directed me to a Legit and real loan lender who have transformed my life from grass to grace, from being poor to a rich and successful man who can now boast of a healthy and wealthy life without stress or financial difficulties. After so many months of trying to get a loan on the internet and was scammed the sum of $5,200 i became so desperate in getting a loan from a legit loan lender online who will not add to my pains, then i decided to contact a friend of mine who recently got a loan online, we discussed about the issue and to our conclusion she told me about a man called John Paul who is the C.E.O of John Paul Loan Service So i applied for a loan sum of (143,000.00USD) with low interest rate of 3%, so the loan was approved easily without stress and all the preparations where made concerning the loan transfer and in less than two(2) days the loan was deposited into my bank so i want to advice any one in need of a loan to quickly contact him via (johnpaulloanservice@yahoo.com), he does not know am doing this i pray that God will bless him for the good thing he has done in my life. Modern times when internet has so much facility of gossip and stuff, your articles have awfully refreshed me. Please be careful on lenders you see online most of them are not what they say they are. AvaTrade is the #1 forex broker for beginning and pro traders. Are you thinking of getting financial assistance, whether you are in serious need of urgent loans, whether you are thinking of starting your own business, you are in debt, this is your chance to achieve your desires because we provide personal loans, business loans, and corporate loans, and all kinds of loan at an interest rate of 2%. HURRAY !!! It's almost get to the end of this year and we were in Lucy Loan Firm, we guarantee all our valuable clients that they will get all the individual loans with a smile on their face. Do you need a loan?,For only 2% interest rate,We give out loan from min of $50,000.00 to max of $50,000,000.00 and re-payment period of 1 year to 50 years, Fill out the form below to apply today. I am very impress on your information, its a really very impressive blog. I really got some another very nice information, so thanks for sharing these tips. Do You Need a loan…..? goodbye to all your financial crisis and difficulties. business .If you are interested you should indicate your interest and we shall assist you in securing your loan. You can call me Dawn, and this little space on the Internet is where I write about becoming financially-free. Join me as we learn more about savings, budgeting, paying off debts, insurance and investing together! Shh! Sometimes I send out secret tips via email. Please note that all statements published on this blog are solely opinions of my own i.e. of a personal nature, and should not in any way be taken as statements of fact. Readers are encouraged to do their own research before arriving at any conclusions based solely on materials provided, or republished, on this blog.